An illustration of color variation from the lack of roots. The Orangeola on the left has many roots while the one on the right is a barerooted Orangeola without a sufficient root system. The Japanese maple (Acer palmatum) is native to the mountainous forests of Japan, but can be grown here in Texas with great success if given shade and water. There are hundreds of cultivars with nearly endless variations of size, shape, habit, color, etc., but Metro Maples only offers those varieties (currently numbering around 110) we’ve successfully grown in the North Texas climate. Upright – These trees will grow to a height of 10-20 feet with an equal spread, depending on the cultivar. Leaves tend to be palmate (hand-shaped with 5-7 “fingers”) and come in a wide range of colors and sizes. Weeping—These trees have a very delicate-looking lacey leaf, and a weeping, mounding habit. They rarely exceed 5-6’ tall and slightly wider, again depending on the variety. The weeping form and twisted, gnarled branches combined with intense fall colors can create an excellent focal point in the landscape. Dwarf— This grouping encompasses a range of heights, widths, colors, and shapes. Some are short,very wide, and dense, while others are more upright and sculptural. The variety and small sizes of these cultivars make them great for filling in niches and nooks in the landscape. For a complete listing of the available varieties, sizes and prices, check out Our Inventory. Japanese maples are understory trees – they are happiest growing with some protection from a canopy of branches from larger trees overhead. Sun in the winter and spring is fine, but once temperatures get into the mid-nineties, most varieties will need at least dappled shade from midday until evening. Sun requirements and tolerances vary, depending on the cultivar, but generally speaking the red-leaved varieties will be more sensitive than the green-leaved varieties. The most sun-tolerant cultivars are ‘Seiryu’ and ‘Sango Kaku,’ but the species Acer palmatum beats all the named cultivars for sun and heat tolerance. Many people are familiar with the varieties we call “upright reds” – 10-20’ trees that begin the spring a bright red, darken to burgundy for the summer, and then return to a vivid red in late autumn. These varieties tend to be among the most sensitive to the heat here in Texas, so care must be taken to locate these trees in the proper spot and give them the protection and adequate irrigation they need to thrive here. Many “upright reds” will respond to shade and/or dryness by turning green in the summer instead of holding onto their burgundy or purple color. Why does this happen? The tree is simply compensating for the lack of light and water by producing more chlorophyll (which is green). This a “leaf by leaf decision”, and oftentimes a tree will have purple leaves on its outer branches, with green leaves on the lower interior branches. So, if you want your red-leaved tree to stay burgundy or bronze color through the summer, the trick is to get it enough light (preferably early in the day) that the leaves don’t turn green, but not so much light as to scorch the leaves. Usually the magic number is around 2 hours of morning sun, with regular watering about twice a week on average. The best site is under high shade with a north or northeast exposure, but anything with protection during the most intense hours of summer sun will work well. Regardless of variety, you can expect your Japanese maple to have a very shallow, fibrous root system that will peacefully coexist with other trees, shrubs and perennials as well as sidewalks and foundations. Japanese maples will benefit greatly from being planted a few inches above the surrounding soil in a 50/50 mix of organic matter (pine bark mulch, azalea mix, landscaper’s mix, etc) and your native soil. Step 2: Add some organic matter (pine bark mulch, landscaper’s mix, compost, etc.) to the soil you just removed. Mixing in amendments at a 50/50 rate to a depth of 15 inches is especially helpful if you have clay soil. Your purpose in doing this is to help loosen the soil so that the roots have an easier time growing into it and getting the balance of air and water they need. Step 3: Add a couple of inches of your prepared soil to the bottom of the hole and set your tree. You’ll want the root flare (where the trunk widens and transitions to roots) to be a few inches higher than the surrounding soil. Step 4: Fill in the hole with your loose soil and pack it lightly. All Japanese maples can be container grown with outstanding results. It’s best to repot your maple at least every two years, in early spring or late autumn. When you repot, either cut back the roots or move to a larger pot, and give them fresh well-draining potting soil. Container-grown plants need good drainage and careful attention to watering, as they can dry out quickly. It’s a good idea to check the drainage hole occasionally to make sure it isn’t clogged. When you water, you should see water running out from the bottom of the pot. Fertilize with a slow release fertilizer like Osmocote® at half the rate recommended on the package. Occasional use of Epsom salts, at the same rate as your fertilizer, can help release the nutrients to your maple, but typically isn't necessary. If temperatures are expected to go below 15 degrees for an extended period, you might want to protect the roots by wrapping the pot, or move your plant into the garage. 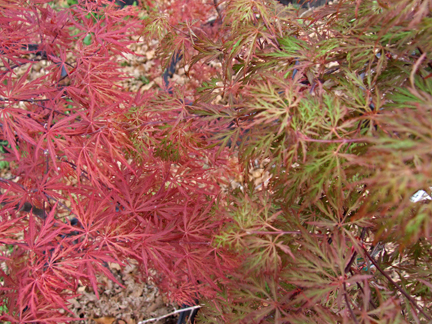 Japanese maples in Texas need water – especially in spring and summer. Typically a deep watering every 4-5 days in the summer should keep them in good shape. More water isn’t necessarily better. The goal is to keep the roots moist, but not saturated. Standing water or soggy soil can stress the tree and invite harmful fungi and bacteria. Allowing the tree to dry out a bit in between waterings will encourage the roots to grow deeper. More roots mean a healthier tree. The key is to keep a balance of water and air in the root system with some moisture always available – like a wrung-out sponge after doing the dishes. The needs of trees change with the seasons, temperatures, humidity, and wind. When the tree is really actively growing in the spring, it will use more water to build leaves and branches. In the summer, the trees use water to photosynthesize and also to cool themselves. A hot, dry, windy day will always cause the tree to use more water than a cooler, or more humid, or calm day would. In the fall, when temperatures cool and days shorten, the trees will use less water, and when the leaves fall off the tree, its water needs drop significantly. No leaves mean no surface area for evaporation. Watering once a month in the winter should be plenty. Japanese maples in the ground do not need large amounts of fertilizer, but do like small amounts in spring and fall. We recommend a balanced slow-release fertilizer like Osmocote®, applied at half the rate recommended on the package. If you’d prefer to use organic fertilizer, we have had good luck with cottonseed meal (slow release, high nitrogen), or fish emulsion with seaweed (nitrogen and micro-nutrients but not long-lasting). It's best to avoid any fast-acting fertilizers. There's nothing inherently wrong with them, but too much fertilizer can cause tip burn and a far less graceful growth habit. Using a slow-release fertilizer will greatly lessen the chances of overfeeding. The best times to fertilize maples are about 3 weeks before they start growing in the spring (late Feb or early March), early May, and as soon as the heat breaks in the fall (usually October). Japanese maples don’t require much in the way of pruning. Here in Texas, the growth rates are relatively slow, which lessens the need for pruning to maintain an elegant shape. It’s best to lightly prune the current year's growth for the most natural and graceful look. You shouldn't have to prune more than once or twice in a year. If you should have to remove large branches, it may take a few years for the tree to fill back in, but it will eventually return to a balanced silhouette. Still, its better to avoid this if you can by shaping the tree as it grows. The ideal time to prune is right after fall color through December when you can see all the branches and make cuts to shape the tree and balance the growth. Light pruning can be done anytime but mid-May gives you the best chance of getting new growth. A mature Japanese maple is rarely bothered by insects or disease. Sound gardening practices, such as good air-circulation and good soil drainage should prevent any fungus problems. Copper sulfate-based sprays or all-purpose fungicides may help with limbs that are dying but cannot be used during hot weather. All summer sprays must be applied early in the morning to prevent phytotoxicity. Even organic sprays are detrimental to Japanese maples during hot weather. Watch for squirrels chewing the bark in later summer. Its rare that they do enough damage to kill the tree, but it can take the tree a few years to heal completely, depending on the size of the wound. Cayenne pepper is said to act as a deterrent, but we’ve seen mixed results. When it comes to digging and moving a tree, timing is everything. If you determine that your tree isn’t in the best location, it’s best to wait until the tree is entering dormancy before you dig– November or December would be ideal, but any time the tree is dormant would be preferable to a late spring or summer move.